The Jeep Commando was manufactured between 1966 to 1973. From 1966 to 1971 the Jeep Commando had a front grille that resembled more like a CJ. In 1972, AMC changed the front of the jeep to look more like a passenger car. Sales fell and the Commando was discontinued after 1973. Because of the short time of production, the Jeep Commando is a rare, hard to find Jeep. A lot of people say the Jeep Commando looks a lot like the International Scout and the Ford Bronco. In 1966, Jeep, then owned by Kaiser, launched the Jeepster Commando to compete with the Bronco and Land Cruiser. The Jeepster Commando was available only in three models: a convertible, pickup truck, and a wagon (like the Jeepster, this was a really cool looking vehicle in my opinion). 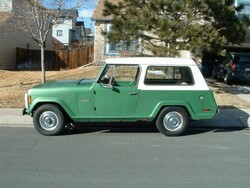 The (Kaiser) Jeepster Commando stayed in production until 1969. In 1970 AMC bought Jeep from Kaiser, and then in 1972 AMC shortened the name to just Commando and changed the grill design to look more like that of a Bronco, but it didn't catch on. The Jeep Commando was taken out of production in 1973. Check out The American Jeepster Club for more on these cool Jeep spin-offs. It's funny because a lot of jeeps have been brought back to life or are a concept vehicle now. I personally think the new jeep commander was brought back to replace the old commando. Sometimes you just can not replace what is lost. The Jeepster Commando was initially produced by Kaiser Motors in 1966 to run up against with the Toyota Land Cruiser and Ford Bronco. It was pmanufactured in three different models which included: the pickup truck, convertible, and wagon. The Kaiser line remained in production until around 1969, until American Motors Corporation or (AMC) bought Kaiser out in 1970. From the time that AMC bought the jeepster line from Kaiser in 1970, the Jeepster Commando steadily grew in popularity everywhere. In 1972, AMC shortened the vehicle's name to simply "Commando" and changed the front end design to be similar with the Ford Bronco. The vehicle line, formerly an AMC best seller, quickly dropped in popularity and was taken out of production sometime in 1973. The Jeepster is an ancestor of the modern Jeep family produced by DaimlerChrysler. There are several Jeepster clubs across the United States. Willys Overland, the original producers of the "Jeep" (originally produced for military use) also produced a "Jeepster" from around 1948 until about 1950. This vehicle led to the later Kaiser productions of vehicles.